Known for his long range shooting ability, he was also a good defensive player. Playing for the legendary coach, Joe Quintal, he was a two year starting guard. The 1939-40 season started slow, but the Kernels came on strong and qualified for the State A Tournament. In a one-day tournament the Kernels defeated Sioux Falls Washington in the first game by a score of 31-22. Playing again that night, they defeated Aberdeen Central by a score of 29-24 to become the Class A Champions. In the 1940-41 season the Kernels won their first eight games and went on to win the ESD Conference Championship. Again returning to the State A Tournament they were less fortunate, and were defeated in the first game by Sioux Falls Washington. During his two years of Varsity basketball Wayne was a Team Captain and received All-Tournament and All-State honors. 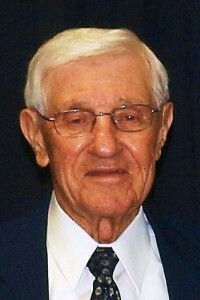 He is a charter member of the Mitchell High School’s Athletic Hall of Fame. As a four year starting guard at DWU, the 1943 Tiger team posted a 19 game winning streak. They went on to win their conference, and qualified for the National Tournamentin Kansas City with a record of 21-1. The Tigers were defeated in the first round by Cape Girardeau, MO., the team that went on to win the tournament. In 1946, after the absence of three years due to WWII, Wayne was recruited by SDSU and Augustana, but he returned to the starting guard position at DWU. The 1946-47 Tigers played a very difficult schedule and ended the season with a 26-4 record. They again qualified for the National Tournament in Kansas City. Playing the defending Champions, Southern Illinois, The Tigers defeated them 44-39. In the second round they were defeated by Eastern Washington State. While playing at DWU, Wayne was a Team Captian and a two time All-Conference player. He received the DWU Athltic Scholarship Award and the Outstanding Athlete of the Year Award. He is a member of the DWU Athletic Hall of Fame. In his first year of coaching, he guided the Emery Eagles to their first State B Championship, under the two-class system, with a record of 31-1. He received the Coach of the Year Award. While coaching at Mitchell, the Kernals won an ESD Championship, and had a team in the 192 State A Tournament. After leaving coaching and spending 29 years with the Sperry & Hutchinson Co., he now lives in Mitchell with his wife Myrna. They have one son Jeffrey. During retirement he has enjoyed hunting, fishing, bowling and golf. He and his wife of 61 years can still be found at the Corn Palace whenever the Kernels or Tigers are playing.